Susan Loucks-Horsley was the lead author of the first edition of Designing Professional Development for Teachers of Science and Mathematics and directed the professional development research for the National Institute for Science Education on which the book is based. 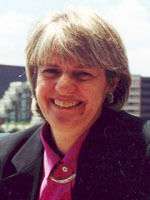 At the time of her passing in 2000, Susan was the associate executive director of Biological Sciences and Curriculum Study (BSCS) and senior research associate for science and mathematics at WestEd. She had previously served as director of pro­fessional development and outreach at the National Research Council’s Center for Science, Mathematics, and Engineering Education, where she promoted and monitored standards-based education, especially the National Science Education Standards. Susan was a leading researcher, writer, and professional developer who enjoyed collaborating with others to address education’s toughest problems. She was the lead author of sev­eral books, including Continuing to Learn: A Guidebook for Teacher Develop­ment, An Action Guide for School Improvement, and Elementary School Science for the 90s. In addition, she wrote numerous reports on teacher development for the National Center for Improving Science Education, as well as chap­ters and articles on related topics. While at the University of Texas/Austin Research and Development Center for Teacher Education, she worked on the development team of the Concerns-Based Adoption Model (CBAM), a classic framework for understanding and leading change efforts.